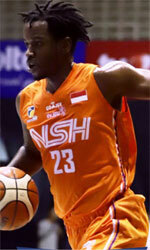 Pelita Jaya outgunned Satria Muda to force the decisive third game in IBL title series. The game was mostly controlled by Pelita Jaya. Satria Muda managed to win second period 23-21. But it was not enough to take a lead and get a victory that evening. Pelita Jaya dominated down low during the game scoring 52 of its points in the paint compared to Satria Muda's 30. American guard Wayne Bradford (193-92, college: Davenport) orchestrated the victory with a double-double by scoring 26 points, 9 rebounds and 13 assists. American-Bahrain center Chester Giles (211-85, college: Oregon St.) contributed with 18 points, 8 rebounds and 5 blocks for the winners. Four Pelita Jaya players scored in double figures. American forward Dior Lowhorn (201-87, college: USF) replied with 33 points (!!!) and 5 rebounds and international forward Jamarr Johnson (193-88, college: Widener) added 16 points and 5 rebounds in the effort for Satria Muda. Both coaches used bench players which allowed the starters a little rest for the next games.